Andy finds birds and lists them with the excuse that it’s citizen science. He blogs it, as training for novels, one of which is actually complete, i.e. “not yet abandoned”. One is science fiction and another inspired by growing up in Winchester in the 1960s and 70s. Also “in progress” are other birding tomes, such as travelogues – one of them through Singapore, Australia and New Zealand. His latest ventures are an anthology of short stories, some of which appear on this site (see the links below), and an incipient appearance in Colinthology. 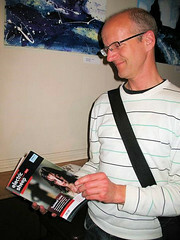 He has contributed to Hidden Bristol and Ashton Walks, and has even received honourable mention from Word of Mouth. He is also HauptUberWebMeister for this site so nothing is his fault. Ever.